fter a distinguished academic career, Mark Siebert once again found time for one of his loves ... composing. Since his retirement from the University of Illinois at Springfield until his death in March 2005, he composed mainly organ and choral music, assisted by workable music programs for computer. Having studied as a Baier Fellow in Church Music and a Ditson Scholar, Mark Siebert was awarded a Ph.D. in Musicology from Columbia University in 1961. His dissertation was an analysis of Fifteenth Century Organ Settings of the Ordinarium Missæ. He worked as Instructor in Music and Conductor of University Chorus at Columbia, and Assistant Professor of Music at the University of Illinois (Champaign-Urbana) and Oberlin College Conservatory. After two years at New Division of Nasson College as Coordinator and Associate Professor of Music, he began a twenty-two year career at Sangamon State University (now the University of Illinois at Springfield). Most of Siebert's teaching career was devoted to undergraduate teaching, much of it to non-majors. He was Director of the Sangamon Consort (an early music ensemble) and he ran a classical music show on the campus FM station. He also supervised an independent learning curriculum and served as associate editor of the University's public affairs magazine, Illinois Issues, where he became "the legal expert on staff!" Dr. Siebert presented papers at chapter seminars of the American Musicological Society, and performed organ recitals in New York, New Jersey, Ohio, Maine and Illinois. His Organist-Choir Director positions spanned five states. His last position was at the Cathedral Church of Saint Paul (Episcopal) in Springfield IL. 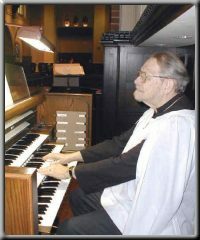 He retired as choir director there in 1998 and as organist in 2002, and was presented the title Organist Emeritus and Composer-in-Residence in June 2002. His organ recital days were over, he said with a touch of whimsy, in 2002. After succumbing to arthritis and having two hip replacements, he gave his last recital: Recital by an Organist with Metal Hips, making sure to include two pieces with fiery pedal solos. My tenure at Saint Paul's has come close to fulfilling earlier dreams. I love the liturgical service. I have aimed at music of the "high art" tradition of every period, although I must admit to a special fondness for the 15th-18th centuries.